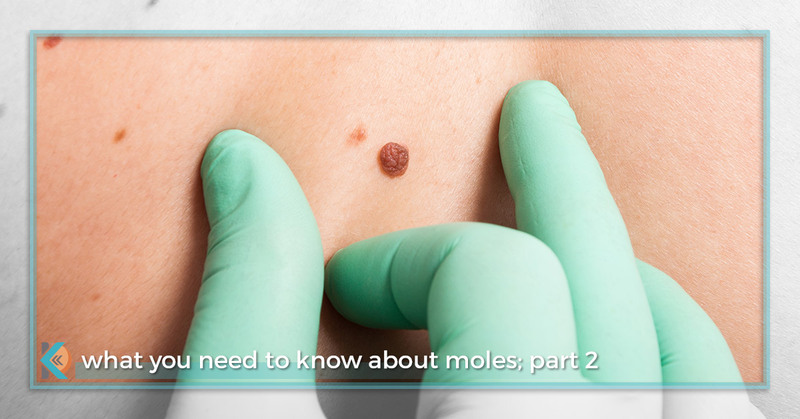 In part one of this blog series, our skin care professionals at Kallgren Dermatology Clinic discussed some of the different types of skin growths classified as moles, including congenital moles and common moles, as well as their likelihood of becoming malignant. Typically, these birthmarks and acquired moles do not pose a significant risk of skin cancer (congenital moles are slightly more risky), though it is still critical to visit your local dermatologist if you notice any changes in terms of shape, size, color, and feeling. On that note, let’s discuss atypical moles, also known as dysplastic nevi. Atypical moles differ from other types of moles because they demonstrate peculiar characteristics. Some are large, some are pink, some are textured, and some have hairs. Often, atypical moles have an irregular shape with fuzzy borders that blend into the skin around the edges, giving them a much different appearance than the small, round, brown moles many of us are accustomed to. Though most atypical moles are benign, many of them resemble melanoma and have the potential to turn into skin cancer if they begin to grow or change color, as is the case if you develop new moles. As with common moles, the more atypical moles you have, the higher risk you have of developing skin cancer. Ultimately, it all boils down to how many moles you have, your level of sun exposure, and your family history. People who have familial atypical multiple mole melanoma syndrome (FAMMM) are at a much higher risk of developing skin cancer, as they not only have atypical mole syndrome (more than 100 atypical moles), but they also have a family history of melanoma. This, of course, is very rare, but it goes to show that perhaps the biggest contributing factor to melanoma is genetics, aside from excessive sun exposure. As previously mentioned, some atypical moles demonstrate symptoms of melanoma, even though they might not be cancerous moles. Other types of moles like congenital moles, on the other hand, can become malignant without demonstrating noticeable symptoms for quite some time. That’s just the nature of moles and skin growths — they can be deceptive to the untrained eye. Because of this, it is incredibly important to visit your dermatologist on a regular basis. Only skilled professionals can truly determine whether a mole is malignant or benign, or if it has the potential to become cancerous in the future. If you are concerned about a mole or any other kind of abnormal skin growth, feel free to contact our skin care experts at Kallgren Dermatology Clinic in Boulder or book an appointment online.